Visitors to Greece may be aware of the history of Athens and the "Golden Era" of Pericles. It was here that European civilisation can be said to have been born. Here was the cradle of democracy. Here thrived the architects, philosophers, lawmakers and artists of the first great city of the West. Though these visitors may acknowledge the myths of the Gods of Olympus, not many of them give a thought to the history of Pieria. 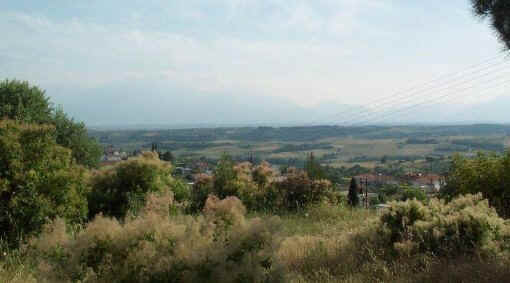 Yet one of the more decisive battles in Greek history, the battle of Pydna (168 BC) took place on and around the fields of modern day Katerini. This was the battle that ended Macedonian control of Greece, allowing the Balkans to become part of the Roman Empire. From the end of the second Macedonian War (196 BC) onwards the Romans took an active part in Greek political disputes. Even though the Greeks were divided into many states, they realized the danger that this presented, and so the majority of them were in favour of the war, which then took on an intensely nationalistic character. The government was principally oligarchic, and many of the Macedonian ruling families favoured the Romans, thinking that they would keep their privileges, land and influence if the Romans were to come to power. However, somewhat surprisingly, the popular masses put their fighting spirit behind Perseas, the new King of Macedonia. This may have been because he appealed directly to them, and they felt that their lot would be better under his rule. They were probably right. The Romans under the command of Aimilios Pavlos had been steadily advancing Northwards from Athens, and were now in control of the country as far as Larissa, a town 80 kms. to the South of Katerini. Between Larissa and Katerini lies the valley of Tempe. The army succeeded in passing through this natural obstacle without difficulty, however when they reached the Enipeas river, which flows from Litochoro to the sea, they were confronted by Perseas’ army, and retreated. There are shades of the battle of Thermopylae here, for a traitor is believed to have "sold the pass", and shown Emilios Pavlos the way round the back of Olympus, along its Western slopes. The Roman army was a substantial one, numbering some 40,000, well-trained and well-prepared for battle. They had elephants, the tanks of their day, and they moved through modern day Kokkinopilo and down the mountainside to Petra. The topography has changed somewhat over the past two thousand years. The rivers followed a different course, further to the south, and the sea came much further inland than today. Moving the Elephants through the mountains and down the steep pass to Petra was a massive task. This was achieved by means of wooden platforms which were slid down the mountain tracks. When the army reached the plains below they moved along the ridge of hills which today joins Kondiarotissa and Nea Efessus. There is some argument over the site of the battle itself, two or three alternatives being suggested. Pydna is a seaside village, which must have been the main harbour for the region 2000 years ago. St. Paul is reported to have sailed from there after his visit to the area, when the Romans were pursuing him. This visit led to his "letter to the Thessalonians". One putative site is in the area of the village of "Nea Efessus", on the outskirts of Katerini. It is situated at the end of a line of hills dividing the plain into two segments, with Katerini to the North, and Larissa and the valley of Tempe to the South. If you visit the site and climb the hill to the church and beyond, you have a fine view to both North and South. Try and conjure up in your imagination the scene of 2,200 years ago – the soldiers expectant before the battle, the horses affected by their excitement, and the massive elephants lined up ready for combat. They were in fact to prove one of the decisive factors in the battle. On June 22nd the two opponents arrayed themselves in battle order on either side of the River Lefkos. The Romans had made sacrifices to their Gods before the battle, and in the first instance these had suggested a discouraging outcome, however Aimilios Pavlos instructed his priests to try again. On the second attempt they received more encouraging signs, so he said that although they might find the fighting heavy going at the outset, he was confident they would win in the end. The battle began when a stray horse wandered into the river and both sides tried to capture it. Fighting broke out, and the order to charge was given at noon, when 800 Thracians under the command of Alexander clashed with 3,000 Roman infantry and 120 of their cavalry. The two opponents immediately received reinforcements. When Perseas saw that the Greeks were in fine form because the battle was going well for them, he ordered a general attack. His forces were arrayed as follows: the cavalry were to the right, beside them were the allied light infantry troops and a 3,000-man officer corps. In the center was the phalanx with two flanks: the right flank had soldiers carrying silver shields, and the left copper shields. To the left of the phalanx was another officer corps of cavalry, a 3,000 detachment supported by groups of Thracians and Paiones. The troops armed with the "Sarisa" – the 6 to 7 meter long wooden pikes – were deployed in the centre, the first four rows holding it in a horizontal position, those behind at an angle. The Roman troops on the other side of the Lefkos River had their cavalry on the left with allied troops alongside them. The javelin throwers were centrally placed at the front of the troops, while behind them were three rows of Legionnaires. The allied Roman forces were placed on their right. Just beyond that point were 120 horsemen, 22 elephants and the corps of the other allied forces. The Romans were armed with swords, which were obviously much shorter than the Sarisa, and shields, however this was to prove to their advantage in the end. Aimilios Pavlos, who had been situated on a hill above the battleground, noticed that the Macedonian troops had trouble manipulating the Sarisa over undulating ground and he successfully manouvered his opponents into attacking uphill, where they were at a disadvantage. In all, between 41,000 and 42,000 Greeks were mobilized against slightly more than 42,000 Romans. As the first Greek legions began crossing the river, the General commanding the Roman forces, Aimilios Pavlos, ordered the attack. He inspired his troops by circulating among them without helmet or breastplate. The first Greek forces to emerge from the river attacked the first Roman units. These consisted mainly of Italian allies. They battled bravely, sacrificing many of their men, however they failed to stop the invincible Macedonian Phalanx. In order to counteract the pressure of the Greek left flank, Aimilios Pavlos sent 22 elephants under his command into battle, with the greater portion of his allied cavalry. The forces, especially the elephants, played a defining part in stopping the Greek advance, as Perseas’ specially trained men couldn’t complete their mission. After that, Aimilios turned to face the phalanx. His attempt failed because the long Macedonian javelins hit the Roman soldiers directly in the face. However, It seems that Perseas and his generals were not following the progress of the battle very closely. Perseas was apparently wounded, though not seriously, and left the scene of the battle, returning to Pydna, which was where the army was based. The Macedonian cavalry on the left flank followed, but the Roman navy, which was lying along the shore, killed many of them. On the other hand, Aimilios was fully in command, and he ordered his legions to proceed towards the rough terrain of the mountain, and in so doing, drew the Macedonian phalanx in that direction. The Greek phalanx, moving upwards, attacked the roman force. The Romans were retreating, while continually replacing and changing their 3 rows. Because of the roughness of the soil and the length of the front, the phalanx was forced to divide and so, finally, some gaps appeared among the ranks. These divisions destroyed their cohesion and therefore their strength. Aimilios Pavlos, realising this, ordered his forces to penetrate the gaps of the phalanx, fighting at close quarters with the Macedonians where his troops, with their shorter and more mobile swords, would be at an advantage. Perseas had failed to see this danger, which was thus to prove his downfall. In spite of the vagueness of the differing sources, it seems that the Roman general used a cavalry of 4,080 horsemen on his left flank to break through the Greek phalanx. This vigorous attack was launched against the Macedonian phalanx, which was now well scattered, and the reorganized legions attacked the Macedonian central point. At this point in the battle Lefkios Postumios Alvinos, the officer in charge of the second legion, attacked the right phalanx, while the General himself, as head of the first legion, attacked the center. Here he brought his elephants into play. With this charge the Romans easily broke through the Greek lines, owing to the elevation of the ground, the lack of coordination of the Greeks, the heavier weaponry of the Romans and also the fact that they were better trained. It is of interest to examine some aspects of the battle in greater detail. Firstly, for the Romans to be forced to retreat after the first attack can only have meant that they had many dead soldiers. The phalanx soldiers struck at the face of the enemy, therefore there was no room for mere wounds. In a similar battle at Kinos Kefales when the battle tactics of the Macedonian phalanx was of much the same nature, the Romans were left with 700 dead. Logically speaking, one may conclude that in this much more aggressive attack, and with the substantially larger forces involved at Pydna, the corresponding number of Romans killed must have been much greater. Quite apart from anything else, they had been forced to retreat. If there were 700 dead at Kinos Kefales, with the number of fighting men more than double at Pydna, there must have been at least 1,400 – 1,500 dead in this battle. Everything points to there having been huge Roman losses. The battle however, was not just the initial skirmishes. There were other furious clashes when the Macedonian phalanx was broken through. The battle-wise Macedonians, of course, did not just "sit on their hands" but fought hard. The course of the battle raises many questions, one of the most critical concerning the half hearted efforts of the better Macedonian cavalry, which allowed the opposition to scatter the phalanx without apparent difficulty. Later, at a crucial moment, when the battle was going badly, the cavalry failed to intervene to restore the balance. Such intervention at this point would even have justified its sacrifice. Perseas has been held responsible for this mistake by some sources, who present him as being defeated before the battle had begun, (see above) and suggest that there were many occasions during its course when he could have won. It is possible that the catastrophic negligence of the Macedonian cavalry, lay in political motives. The cavalrymen were the sons of the Macedonian aristocratic families, who had become displeased with Perseas because of his political approach favouring the masses. The concentration of so many infantry forces, made up of the ordinary people, gives some clue to Perseas’ feelings towards the masses. This might have been the correct military tactic to fight the Romans, but it brought the King into conflict with those of his own class. Perseas was an ill-tempered person, and this in all probability led to a conspiracy, which revealed itself during the critical phase of the dramatic conflict. The war with the Romans had taken on an intensely political dimension as well as an ethnic nature. The Oligarchs of the Greek states, as well as the Macedonian Aristocrats, sided with the Romans in order to save their fortunes and their privileges. In so doing, they aimed to preserve their benefits as a nation. On the other hand, the masses of poor people stood and fought to the end, which is the reason for the huge number of dead. This point of view is reinforced by the fact that the cavalrymen abandoned their King, in order to reorganise the remaining forces and find new ones, probably mercenaries. Perseas was betrayed by the ruling class of his country, and was left to be defeated, with disastrous consequences for his country, if not for the entire nation. A short while later he was betrayed again, and taken captive by the victor Aimilio Pavlo. The battle of Pydna was highly significant because it meant the defeat of Macedonia, the most important Greek State left unconquered by Rome. This left the way open for the total subjection of Greece to Rome, then considered the undisputed "ruler of the world". The third Macedonian War was the decisive conflict between the Greeks and the Romans. When the Greeks realised the tragic road they had been following, they joined in the fight with a common purpose, a fight that had taken on a clearly nationalistic character. However, they failed. They could not succeed in uniting the broad confederation of forces (Greeks, Hellenic, and even barbarian) that would be needed to compete with the enormous might of the Roman Empire. My thanks to Demosthenes Foundoukas for his help and advice and to Joanna Kalfa for her help with translation.